The Mojave Desert has a rich natural history. Despite being sandwiched between the larger Great Basin and Sonoran Deserts, it has enough mountains, valleys, canyons, and playas for any eager explorer. Ancient and current waterways carve the bajadas and valley bottoms. This diverse topography gives rise to a multitude of habitats for plants and animals, many of which are found nowhere else in the world. A Natural History of the Mojave Desert explores how a combination of complex geology, varied geography, and changing climate has given rise to intriguing flora and fauna—including almost 3,000 plant species and about 380 terrestrial vertebrate animal species. Of these, one quarter of the plants and one sixth of the animals are endemic. The authors, who, combined, have spent more than six decades living in and observing the Mojave Desert, offer a scientifically insightful and personally observed understanding of the desert. 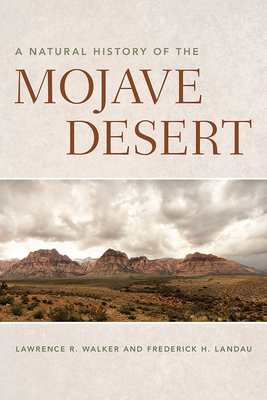 They invite readers to understand how the Mojave Desert looks, sounds, feels, tastes, and smells. They prompt us to understand how humans have lived in this desert where scant vegetation and water have challenged humans, past and present. A Natural History of the Mojave Desert provides a lively and informed guide to understanding how life has adapted to the hidden riverbeds, huge salt flats, tiny wetlands, and windswept hills that characterize this iconic desert. Lawrence R. Walker is a professor of plant ecology at the University of Nevada, Las Vegas. He is the (co)author or (co)editor of nine previous books, including The Biology of Disturbed Habitats. Frederick H. Landau is a research associate at the University of Nevada, Las Vegas. Walker and Landau have twenty-five years of scientific collaboration that includes projects in Nevada, New Zealand, and Puerto Rico. They both enjoy hiking and back-road adventures throughout the Mojave Desert.